Bio-Oil is a miracle beauty product I stumbled upon a few years ago. I bought it during a pregnancy brain moment thinking it was the cure to stretch marks. It is marketed as a stretch-mark, scar, skin tone corrector, and moisturizing product, view Bio-Oil site here. I cannot say for certain if it is a stretch mark cure! I did faithfully lather my torso in Bio-Oil during my pregnancy and have few, if any noticeable stretch marks! Bio-Oil is an amazing product for skin, hair, and nails! 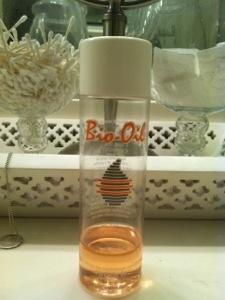 I use Bio-Oil for the moisturizing and skin tone correcting and benefits. I apply it every night to my face, hands, and feet before bed. As soon as you apply Bio-Oil to your skin, it feels silky and smooth! I would not recommend it as a daytime moisturizer, the main ingredient is PurCellin Oil, so it is a bit greasy. My skin is sensitive, dry, and has pigment damage. I feel confident in saying the use of Bio-Oil, along with daily sunscreen use has greatly improved my overall skin tone and faded my pigment spots. A small amount of Bio-Oil goes a long way. I have used about one and a half bottles in a little over two years! I also have a travel sized bottle in my overnight bag, I originally bought Bio-Oil at Costco for $15 for a 4.2 oz bottle and a travel sized bottle. Unfortunately my local Costco no longer carries Bio-Oil. I have since purchased it at Wal-Mart for $15 for the 4.2 oz bottle, the best deal I have found for this size. Give Bio-Oil a try, it is a great product! Have you used Bio-Oil? Please share your thoughts. I use bio oil too, when I do I can see the effects immediately, no it does nothing for my stretch marks but since I am not too bothered by that, I agree with you positive assessment of Bio oil. I suffer form pigmentation of skin too, especially areas exposed to sunlight. I need to get regular with my application, your article has just inspired me to lather some on! good job! Thank you for your encouraging words and for reading my blog :-) I will keep posting on other products I use for pigmentation and sun damage.